Yale's Calhoun College: History Lesson or Institutional Racism? Calhoun College at Yale University. Calhoun was a fervent proponent of slavery. Chris Rabb, Yale '92, was able to get this stained glass in the common room at Calhoun College changed. 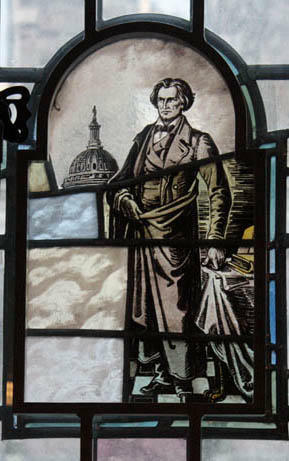 The original glass depicted a black slave in shackles kneeling before the pro-slavery statesman, John C. Calhoun. As South Carolina considers removing the Confederate flag flying over the state Capitol, some are questioning why a building at Yale bears the name of one of this country's most passionate advocates for slavery. In 1932, Yale University transformed the former divinity school building into Calhoun College, naming the residential college after 1804 Yale grad John C. Calhoun. Calhoun later went on to be Vice President of the United States, and a U.S. Senator from South Carolina. Calhoun was also an unapologetic slave owner and fervent proponent of slavery. For more than 50 years, a stained glass in the common room of Calhoun College depicted a black man in shackles kneeling before Calhoun. "I was insulted. I was shocked. I was mad as hell," said Yale alum Chris Rabb, who is African-American on WNPR's Colin McEnroe Show. He was proud that he was able to get the image of the black slave removed from the stained glass, but his family thought otherwise. "I was insulted. I was shocked. I was mad as hell." "They said: 'No; what you did was wrong. We need these reminders of institutional racism. We don't want any successive generation of black folk, or anyone else coming through Yale thinking that Yale is anything other than what it is,'" Rabb said. Jonathan Holloway, Yale Professor of American History and Chair of Yale's Department of African American Studies, said that in the past, he has agreed with Rabb's family. In an article last year in Yale Alumni Magazine, Holloway said that Yale should retain the name Calhoun College "as an open sore, frankly, for the purpose of having conversations about this... I want to hold Yale University accountable for this." "The historian in me sees with alarm our national propensity to forget ugliness for the convenience of the modern moment." I have to confess, however, that the events of the last 18 months and especially the monstrosity in Charleston have rattled me. Yes, the historian in me still sees with alarm our national propensity to forget ugliness for the convenience of the modern moment, but the citizen in me just keeps seeing example after example of an inability to imagine that African Americans have a humanity that ought to be respected. "I don't think that when people see the name Calhoun, they walk by it, and then that prompts them to say, well, who is Calhoun, and what did he do?" said Khalilah Brown-Dean, associate professor of political science at Quinnipiac University. 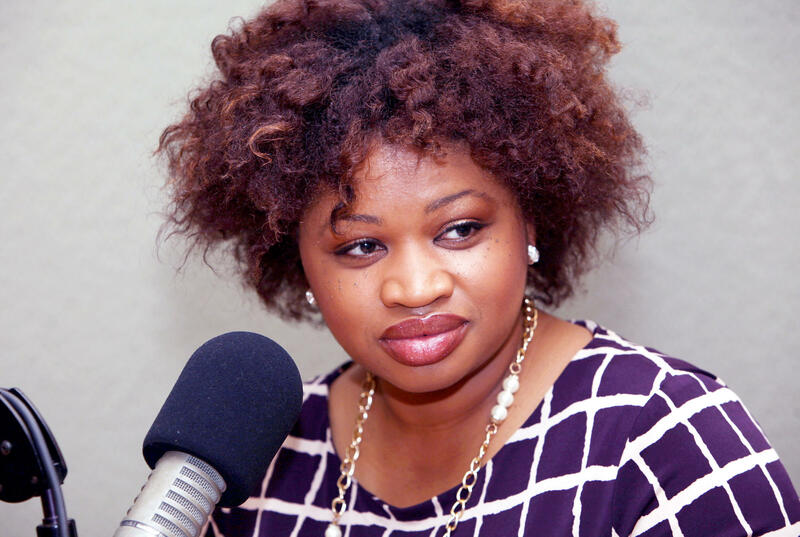 Khalilah Brown-Dean in a WNPR file photo. "Having those repeated names and symbols, to many, is just a further infliction of hurt." "We are not having those conversations, so having those repeated names and symbols, to many, is just a further infliction of hurt. It is not producing conversation," Brown-Dean said. Karen Peart, deputy press secretary for Yale's Office of Public Affairs and Communications, said the university has no official statement regarding Calhoun College, but referenced Holloway's statements in last year's alumni magazine article. A sculpture of John C. Calhoun is mounted on Yale's Harkness tower, along with such notable alums as Nathan Hale and Eli Whitney. Monuments and tributes to Calhoun across the nation have drawn protest in wake of the Charleston church shooting. An online petition calling for Lake Calhoun in Minneapolis to be renamed recently surfaced. In Charleston’s Marion Square, a statue of Calhoun was recently defaced with the word "racist" in red spray paint. South Carolina's most prominent political leaders say it's time for their state to stop flying the Confederate battle flag on the grounds of its Statehouse. Gov. 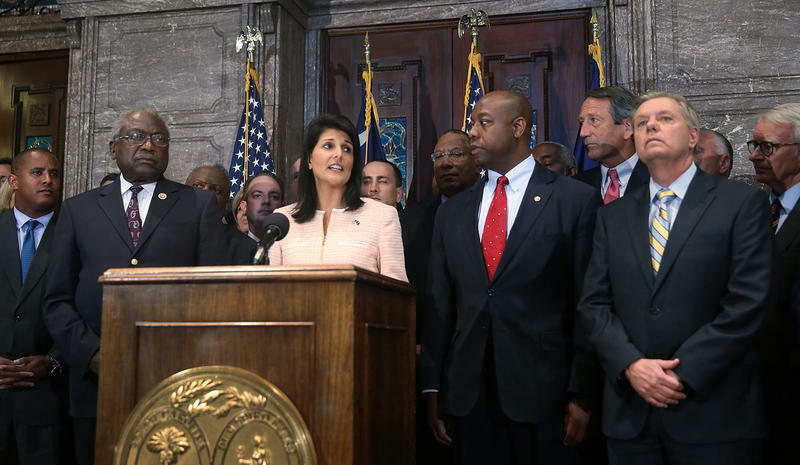 Nikki Haley made their position clear Monday afternoon, speaking alongside Sen. Lindsey Graham, Sen. Tim Scott and others. Calls for moving the Confederate battle flag have grown since the shooting of nine black church members in Charleston last week. After speaking about the efforts to cope with that tragedy, Haley said that she has seen "the heart and soul" of South Carolina. In the wake of another mass shooting, President Barack Obama took the podium in the White House press briefing room to address reporters. The shooting in a black church brings up a "dark part" of United States history. "This is not the first time that black churches have been attacked, and we know the hatred across races and faiths pose a particular threat to our democracy and our ideals," Obama said. This hour, we explore several threads of the post-Charleston shooting, from the symbols of racism to the use of mental health to explain tragedy.